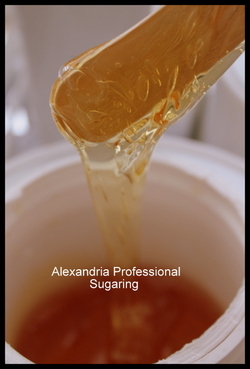 The Alexandria Sugaring company has been a huge influence in introducing salons and spas to sugaring paste, a gentler hair removal option over waxing. More than just selling, licensed professionals must take a training class and pass a test before they get certified using their technique and products. While I’ve tried sugaring gel (used similar to waxing), but not sugaring paste. So I found Allure Derma Spa (now Organique Derma Spa and Salon) in Westlake, Ohio that has a technician, Marijana, trained in using Alexandria products and made an appointment for my underarms. The Prep. Going into her facial room, I slipped into a spa wrap so underarms would be fully exposed. Marijana showed me a glimpse of one of her super smooth underarms that were still hairless from sugaring two weeks prior. Looks good to me, I thought. She turned on her facial light, cleansed my underarm skin and applied a bit of powder. The Process. Wearing gloves she pulled some sugaring paste out of a jar from a warmer, to my surprise the paste was very white, instead of a caramel color like I had expected. Marijana put on the paste and artfully spread it, working in sections of hair growing in the same direction. With wax you can feel some warmth on the skin, but the sugaring paste felt room temperature. Taking the paste in fast flicking motions the hair was getting removed. Waxing in general is much easier to learn, as Marijana said that it took her some time to get the correct sugaring technique down. (See a body sugaring).